The highlight of my day was going to a small farmers market while visiting my family in Houston. 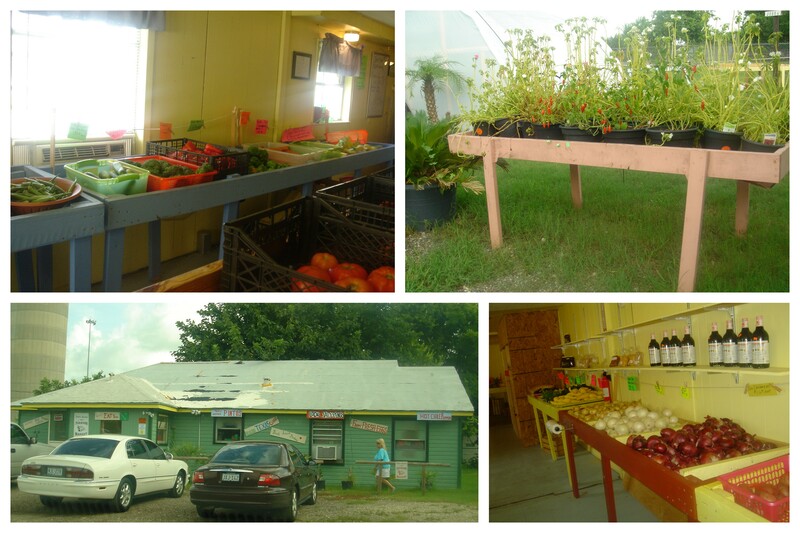 It is always fun going to see what local farmers and their vendors have to offer. We bought some tomatillos, garlic, red tomato, red pepper, poblano peppers, and summer squash. They had plenty of vegetables, fruits, local honey and free-range eggs. We are planning on making some green salsa tomorrow so I’ll post the recipe if it is delicious. Why Buy Local? Buying food that was grown local usually within 100 miles of where it is sold cuts down on greenhouse gas emissions and air pollution from transporting the food long distances. You also get it fresher than a supermarket only a day or two after it is harvested where as the supermarket it may be from 4 days to a week after harvesting. The exciting thing is sometimes you can directly ask the farmers questions about their produce or other products. Most small farmers will not be certified organic because it is an expensive label that they cannot afford but instead are called sustainable farmers. Sustainable means food production methods that are healthy, do not harm the environment, respect workers, are humane to animals, provide fair wages to farmers, and support farming communities. It is important to make sure that the local food you buy from farmers or gardeners are using sustainable methods because some may use pesticides, chemical fertilizers, hormone use, and use of antibiotics. Where can you find local food? 1) Local farmers markets or family farms can be found at http://www.localharvest.org/ just enter your zip code and it gives you a list. 2) Join a Co-op. We were a member of a food co-op in Dallas but our host moved and I quit for a while but plan on joining once the school year starts again. Here is their info http://www.yourhealthsource.org/. Or you may find one in your state at http://www.coopdirectory.org/. 3) Buy at Whole Food, New Flower Market or other Health Food stores. I am grateful to have a Whole Foods less than 2 miles from my house. They usually have a sign on the produce that it is locally grown, they also produce their breads locally, have some local dairy from Lucky Layla Farms and sell raw local honey. 4) Find Restaurants that serve local or organic food. Some can be found at http://www.eatwellguide.org. Are we Locavores? My goal is to buy and eat more local when available. I plan to visit a farmers market once a month, buy local at Whole Foods and join the food coop. Try it out! Going to the Farmers Market on the weekends is a fun thing to do with the kids let them meet the farmers and ask questions too.